We’ve become accustomed to Bella Hadid looking a certain way: whether she’s dominating the covers of Harper’s Bazaar Arabia, Allure, Vogue Japan or British Vogue, glamour is almost always the aesthetic. 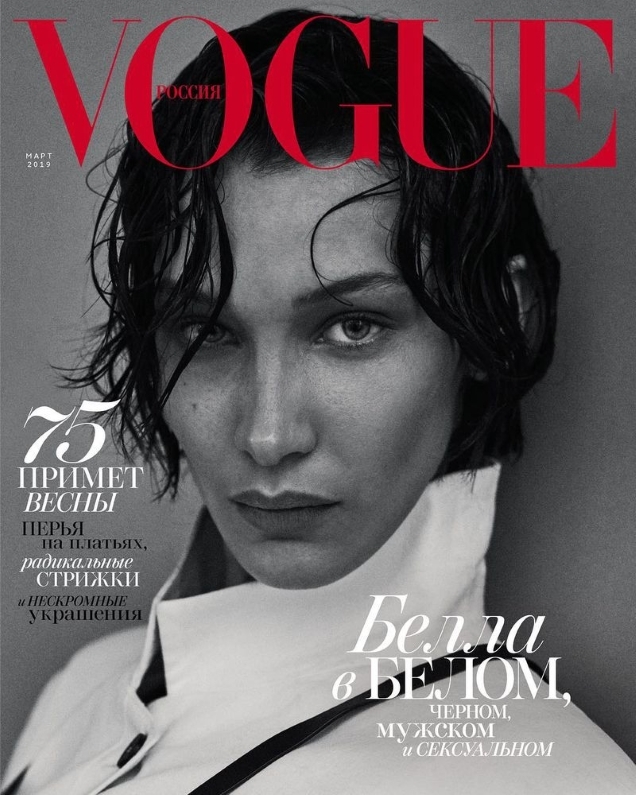 After fronting just about every other edition of Vogue, Bella makes her Vogue Russia debut for March 2019 (also her first cover of the year). Photographed by Giampaolo Sgura and styled by Celia Azoulay, the current face of Versace and Moschino ditches the glam, sporting wet hair and virtually no makeup. Needless to say, members of our forums were expecting more. “I prefer the first cover, it looks very striking, but this new hairstyle doesn’t do her any favors. I know all the Vogues are all out on some secret androgynous agenda right now, but that doesn’t suit models like Bella,” noted Benn98. “What the hell is that haircut,” russianelf said. “Yikes. She looks gorgeous in high glamour editorials and beauty shots but you strip away all that and what you’re left with is a not very versatile face for someone that’s supposed to be a supermodel,” dodencebt added. “Both covers are tragic for more than one reason: the photographer, the hair, the pose in the first one, her lips and chin in the second one,” apple pointed out. Are you into it? Did Bella deserve better? Sound off and share your thoughts here.